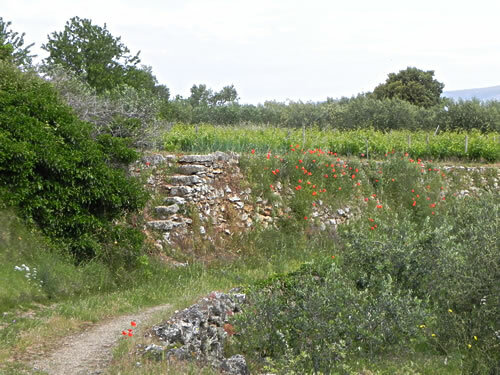 Following my previous blog on Hvar’s drystone walls, I’m moving backwards in time beyond the Greek colonists to the Illyrians, who lived here before them. Between 2,000 and 1,000 B.C. the population began to settle on hilltops. Their huts were defended by ditches and stone ramparts some of which were massive. 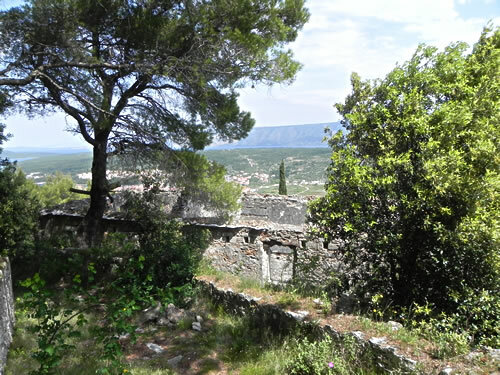 One of these hilltop fortified settlements is Purkin Kuk, set on a hill to the south of Stari Grad. It’s 276 metres above sea level, with superb views of the surrounding area. 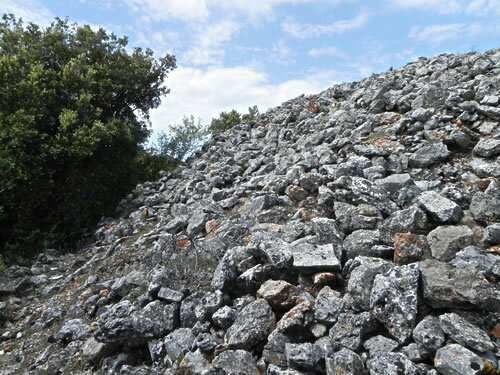 The stone mound is one of the largest on the island, and may have had some ritual significance, in addition to clearing the land for cultivation. 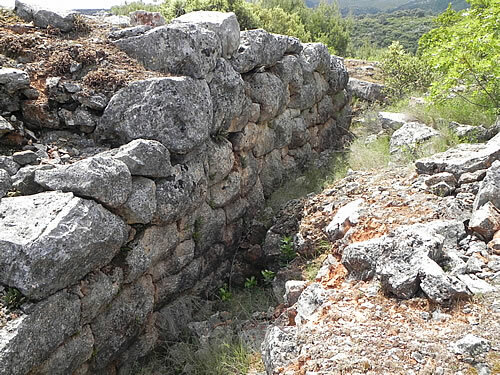 Dating from around the first millenium B.C., it was possibly associated with an ancient settlement at Stari Grad, and the nearby agricultural land. 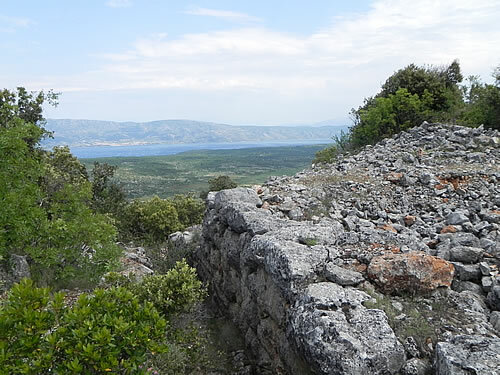 At the same time, there were several other larger hilltop settlements, such as at nearby Gračišće, and also on the site of today’s fortress above Hvar. At the western end of the site are megalithic walls that form a square roughly 20×20 metres with an entrance to the south. 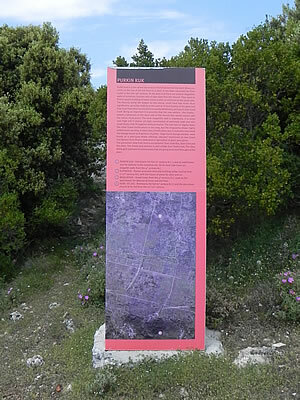 The foundations are Illyrian with overlays of later Greek construction. Some of the blocks are absolutely massive, and the walls are constructed without mortar – which might imply Greek builders. 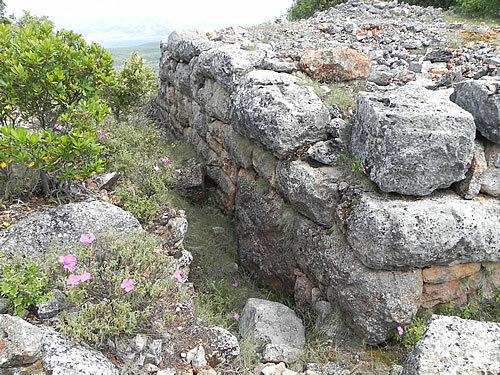 Yet smaller stones have also been used and the layers are not even, so although well built, it’s not in the same style as the Greek watchtowers of Tor and Kupinovik. Later work appears to be a lookout tower or storage for a sanctuary. Fragments of pithoi have been found, large round storage vessels used by the Greeks. It was excavated in the late 19th century by Šime Ljubić, and that ditch can still be seen. The views from the hill are simply spectacular. But of course, that means a good walk to get there! Maps of the trail are deceptively simple, showing a short branch off the road into Dol to reach Purkin Kuk. 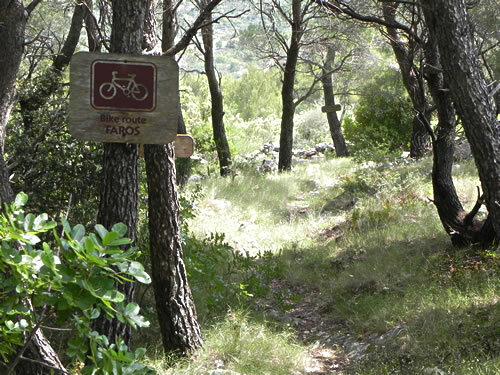 The route is also shown as a bike trail, so we were expecting a reasonably easy uphill trek. Especially as the hill really doesn’t seem that high when seen from below. You have to bear in mind, though, the local optimism and the tendency for signposts to run out just when you need them most. We set off on the walking trail following the helpful signpost on the road into Dol. Notice also the sign to Likorova Kuča, which is on the way, and has more signs at crucial junctions! But we didn’t know that at the time. So, onwards to the tiny church of Sv Rok, where for lack of any other information, we continued to follow the track round to the right. 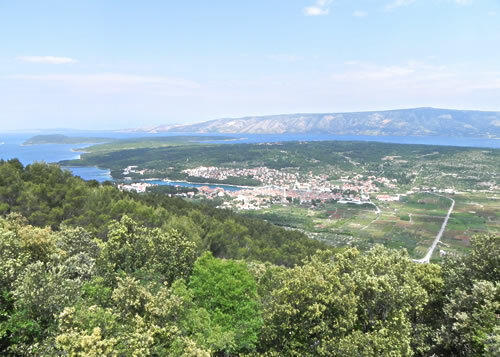 It was lovely, nice and wide with lots of flowers and views of the Stari Grad plain, but clearly headed downhill, not up. Wrong way, or at least the wrong direction! So, back we went, and found a small footpath to the right of Sv Rok heading uphill. No signs. This must be right, though? Onwards and upwards following winding stone walls in and out of shady pine groves. At each junction we guessed which trail to follow, and if it started to head downwards we’d backtrack and try again. 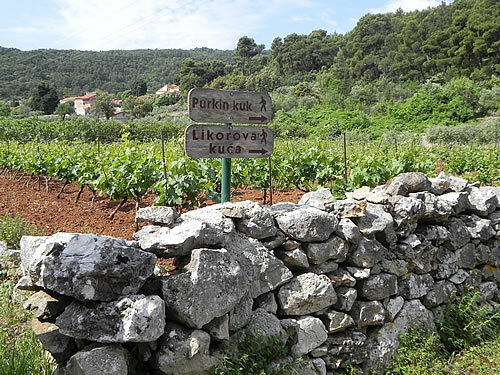 There were a few signs for Likorova Kuča on the way up, and one for a bicycle trail. Heaven help the cyclists! As a footpath it was fine, if a bit overgrown in places, but really, bicycles? The Likorova Kuča turns out to be a large ruined farmhouse, now completely deserted but must once have been beautiful. And, thankfully, once past there, we found a sign for Purkin Kuk again. Keep heading uphill from there until you find the official marker for the ancient monument. And it’s definitely worth it. At least part of our problem finding the right footpath is due to the hillside being cross-crossed by trails leading to/from Dol, Stari Grad, etc. If you take a different approach you may arrive on one of these paths and have to work out when to turn uphill. Good luck!